I’ve been having an extremely busy year and didn’t get to take a vacation yet. Before I knew it, summer was about over and I had to tell myself to get out and do something before winter gets here. Going through “The Green Guide” to the Netherlands I found out about the annual Mussels Festival in Yerseke, which is held on the last Saturday of August. I’ve been to Zeeland a few years ago but didn’t know anything about Yerseke, the mussel capital of the Netherlands and had to check it out. The weather was beautify on August 20 with plenty of sun and a good day to be out and walking around. With such nice weather it meant a great deal of people traveling down south for the festival and of course traffic jam for many kilometers. It was worth the drive and I got to see how mussels and oysters got to the table with a tour of the storage and packing facility. 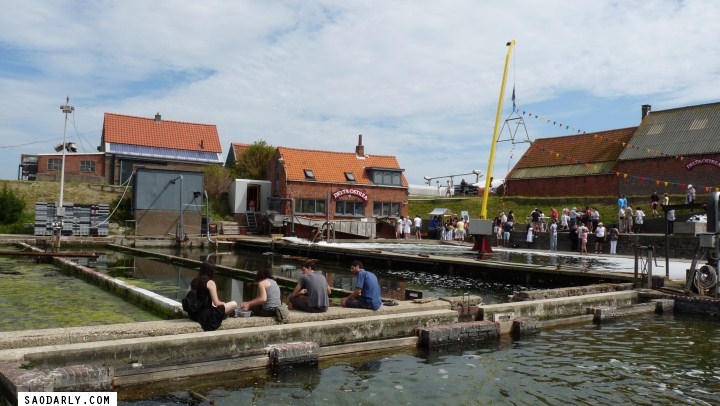 There are plenty of activities to keep and young and the old busy at Yerseke Mussels Festival in Zeeland. Taking a boat tour through the ports one of the activity a family can do. I didn’t feel like getting on a crowded boat and only walked through the flea market and checked out the boats along the harbor. For those that enjoy eating mussels, for 2 Euro per portion, they can buy a voucher and get in a long line for a freshly cooked mussels the traditional way. Besides the traditional eating of mussels, one can experience various tasting dishes with mussels from 8 restaurants at the Mussels Festival “Culinary Square” by buying vouchers to redeem at the restaurant booths. I wanted to try out the grilled mussels and the Thai mussels dish, made with pepper, coriander, and lemongrass but didn’t go back to the “Culinary Square” after a tour through the center of the town. I did buy enough fresh oysters to take home for dinner and would go back some day to sample one or two dishes at the “Culinary Square” for the sake of adventure.